In her book-lined office overlooking lower Broadway in New York, Arianna Huffington keeps a large sofa in the corner. With its richly carved wooden accents and overstuffed cushions, the sofa is the sort of opulent accent you'd expect from an executive like Huffington, who is partial to Dolce & Gabbana and Manolo Blahnik. The only unusual thing here is the message on a needlepoint pillow: "Sleep your way to the top." This, as it turns out, is Huffington's latest mantra—not in the bawdy joke sense, but a literal one. Huffington's latest book (her 14th), Thrive, preaches the importance of eight hours of sleep every night, as well as unplugging your digital devices and leaving work at the office. "The science is now incontrovertible that being able to take care of yourself is a performance enhancer," Huffington says. "We're living our lives under this collective delusion that burnout is the way to succeed, and it's just not true." If that seems like a strange message coming from one of the most driven executives in media—one who travels the speaking circuit, blogs incessantly and still finds time to run one of the biggest news portals on the Web—it probably is. But Huffington, 65, has an unusual gift for knitting contrasts together. She is a onetime conservative who's now an icon of liberal punditry; she's a Cambridge-trained economist who wound up leading a tech revolution instead. And most famously, she's the founder (along with Kenneth Lerer and Jonah Peretti) of The Huffington Post—HuffPost, as many know it—a news and ideas platform that freely jumbles old-guard reporting with blogged opinions and aggregated content. It's a formula that has won critics but also imitators. Even if you don't like HuffPost, there's a good chance that you've clicked on it. The site pulls in over 200 million unique visitors every month. Today, a decade into her venture, Huffington has been instrumental in changing the way that people consume information. "Arianna has built a global digital brand at the most important inflection point in the history of media," says Tim Armstrong, CEO of AOL, which acquired HuffPost in 2011 for $315 million. "Building that brand has taken vision, leadership and an ability to change as the landscape changes." In 2005, when Huffington started her publication in her Los Angeles home, Facebook was a year old and Twitter didn't exist. The Web was home to bloggers, news aggregators and traditional reporters. Huffington wanted to bring them together. "The goal was to fill a vacuum," she says, "to create a hybrid that was both a journalistic enterprise and a platform that would allow voices—some well-known and some not—to be heard." HuffPost's mingling of reporting, curating and opinionating has drawn fire, especially from journalists who accuse it of normalizing the practice of using unpaid contributors. But Huffington prefers to characterize HuffPost as a media-democracy machine, one that gives bloggers a huge audience they would not otherwise have, and one whose broad mix of content—news and commentary, politics and sports, black voices and gay issues—delivers "the best of the Web." Along the way, HuffPost's sheer size has allowed Huffington to influence national events, not just blog about them. In this respect, Huffington's role as both medium and message is unique—and one she takes very seriously. "Arianna really sees The Huffington Post as having potential to be a positive force in the world," says Huffington's former chief of staff Dan Koh, who left to take a job with Boston Mayor Marty Walsh's administration. "If she can put her own editorial voice on what's happening, it can be used for good." Thrive's quality-of-life gospel, for example, is one that Huffington not only blogs about but also proselytizes via her many speaking engagements and TV appearances, where the pop philosopher with the heavy Greek accent and razor sharp sense of humor enjoys a status that's Oprah-esque. Another example is What's Working, a HuffPost house mandate, to distance the publication from the Internet's usual fare of shaming and ridicule in favor of stories that stress creative problem solving and worthy role models. It sounds like touchy-feely stuff—and it can be—but Huffington believes that positive content is socially beneficial. From a business perspective, it is content that tends to get shared. "Our goal is to reimagine journalism because of the precept that if it bleeds, it leads," Huffington says. "We want to portray an accurate picture of reality—but reality is not 95 percent bad. And we have the data that show people like sharing stories that are uplifting, that are about solutions." What's certain is that Huffington will have a growing audience for her content. Verizon's $4.4 billion purchase of AOL this past summer means that her site is likely to benefit from an owner with deep pockets, though speculation abounds that Verizon might sell HuffPost. The site now operates in 15 counties and is preparing to launch in Mexico and China. "The goal," Huffington says, "is to be all over the world." Huffington's global conquest is not without its challenges. The media mix it pioneered has since been adopted by many rivals. Huffington is unconcerned. "The way I see the world is not to look at what everybody else is doing, except to learn from it," she says. "When you look at the world in competitive terms, you tend to look over your shoulder instead of looking ahead." Huffington remembers well what the critics said when she launched HuffPost in 2005. "We were described as an unsurvivable failure," she recalls, "the equivalent of Gigli, Ishtar and Heaven's Gate rolled into one." Those reproofs didn't dissuade Huffington then, and she seems no less stoppable now. 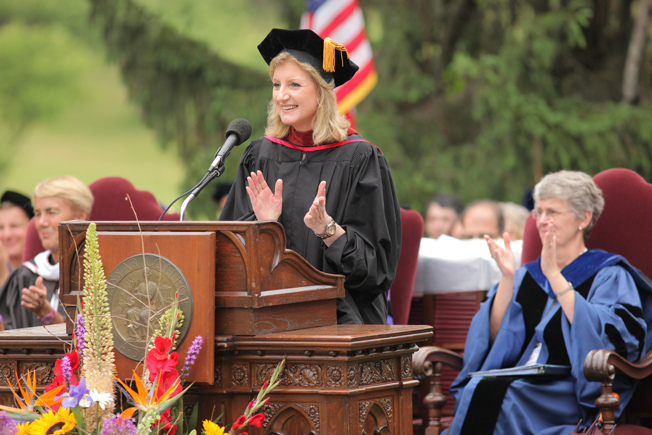 "She came up with this incredibly creative idea and stuck with it," says Catharine Bond Hill, president of Vassar College, which invited Huffington to give the school's commencement address this year. "I think she's just a really wonderful example of sticking it out through hard times and making it work." After a good eight hours of sleep, that is.